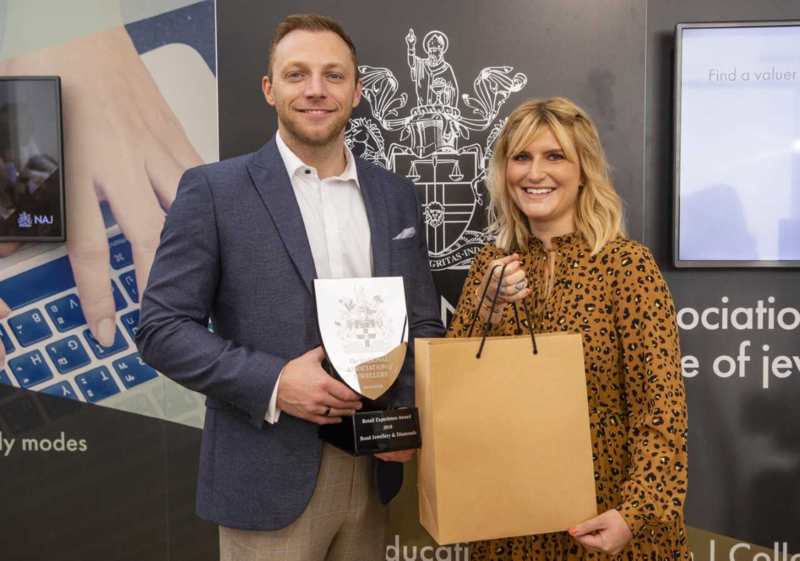 (Pictured above Jamie Beech, from Bond Jewellery and Diamonds, winner of the NAJ's 2018 Retail Experience Award). The NAJ run and support a number of competitions. Our competitions recognise new talent coming into the industry, cutting-edge design and exceptional service. Image: Prime Warden Michael Prideaux, 2019 GCDC Design Award winner Bethan Cubbin, Harriet Kelsall NAJ Chair. Credit Julia Skupny. NAJ sponsors the Design Award at the GCDC Craftsmanship & Design Awards – for 2019, the design of a new badge of office for the NAJ Chair (Award no. 5 here). The UK Jewellery Awards celebrates and rewards excellence for the most innovative jewellery and watch businesses. Every month, leading retail Jewellery software supplier Bransom recognises the individual who has 'the best' JET Certificate project of the month. Course tutors put forward nominations and a winner is chosen by an external moderator. The individual receives a certificate, recognition in the Jeweller and is invited to the NAJ Education Awards.